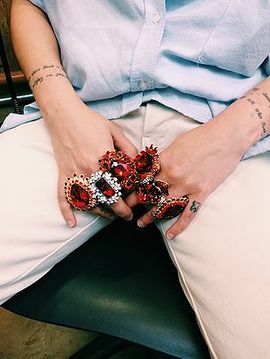 Periods are the last thing we expected to inspire a complete collection of accessories, but that’s exactly what this young jewelry designer has done. 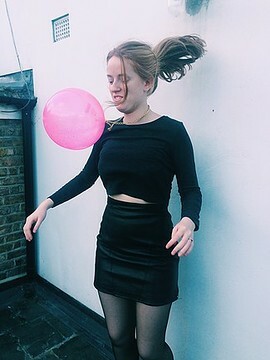 Unlike us, whose feelings toward our monthly period border on annoyance and (at best) mild inconvenience, Lili Murphy-Johnson decided to turn it into something beautiful. Second, the products women use to keep their period at bay. That means tampons, soaps, wipes, and—as shown by the ring below—sanitary napkins. Last and certainly not least, blood (but of course!). 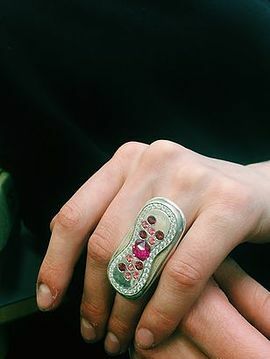 Lili designed oversized gem-encrusted rings in deep, bold red to symbolize the fluids we excrete out of our bodies during each cycle. There’s even a brooch that’s meant to look like period stain! Would you buy this? Visit Lili’s website to see the rest of the jewelry line.